Finishing Up the 2014 Moogly Afghan Crochet-a-Long! And now my blanket is all done! I used the Tight Braid Join technique to attach my squares to each other. I did one round of single crochet around each square, adding or decreasing stitches so that I got 41 sts on each side of the squares, with a ch 2 in each corner. Then I worked the actual tight braid joins, with 14 ch-2 loops on each side, plus one in each corner ch-2 sp. Then it was time for a border! I wanted to keep it solid rather than lacey, but I didn’t want to make it too plain either – I wanted something that would pull the whole thing together. So I played around with the yarn I had left over, and came up with a pattern I’m calling Polka Dot Border! 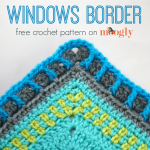 You can find the free crochet edging pattern for that HERE – debuting it this morning! When I started I purchased 24 skeins of yarn – 6 each in 4 colors. And in the end I used all the white, the vast majority of the red and blue (less than a skein of each left! ), and I ended up purchasing 2 more skeins of green to finish the joining and border. Not too shabby! And since I used Lion Brand Vanna’s Choice, dye lot wasn’t really an issue. Officially, Vanna’s Choice does have dye lots, but I’ve never seen a noticeable difference between them. So what have I learned? 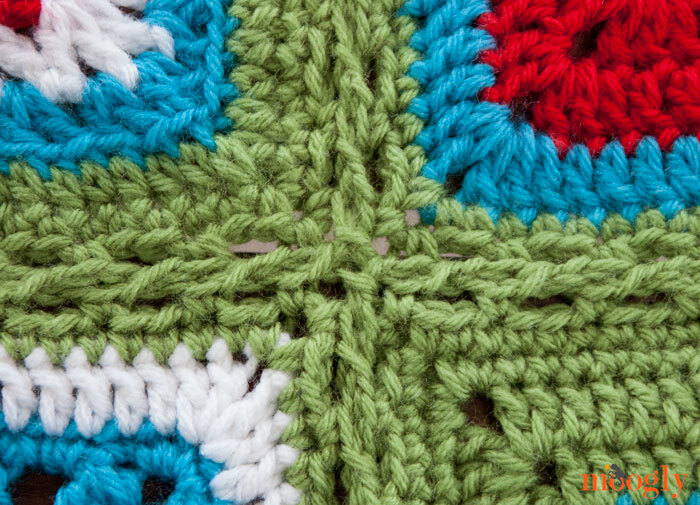 I’ve learned some great new techniques and stitch combos, I’ve learned more about estimating yarn quantity, and I’ve learned more about what people are looking for in a crochet-along. And I’ve also learned that there are about 10 different schools on how to spell crochet-a-long. I mean crochet-along. Crochetalong? And I’m ready to finalize the plans for 2015! I’ll be doing another post with all the details on that before Christmas. Suffice to say, I think I’ve found a great way to keep it exciting while ironing out a couple of the kinks that happened in this first round. And I got some great feedback on the survey that I’ll be doing my best to integrate as well! 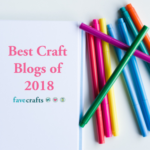 Get Moogly on your favorite social media sites: Facebook, Twitter, G+, Pinterest, Instagram and Tumblr, and sign up for the Newsletter so you don’t miss a thing! 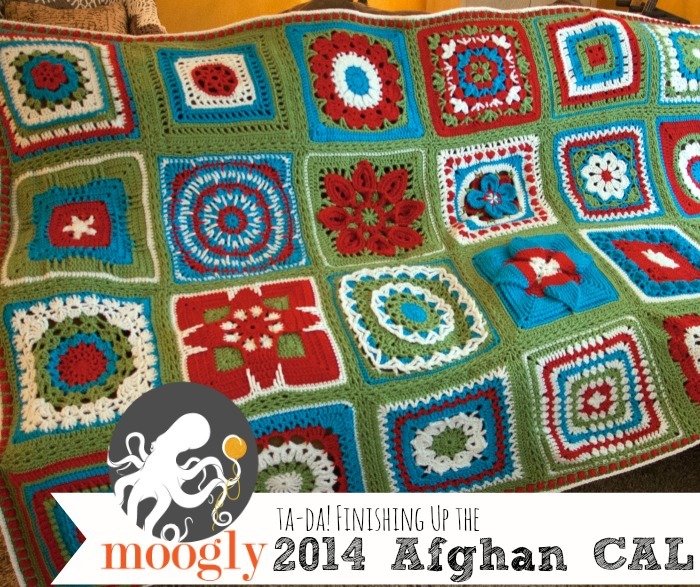 The 2014 Moogly Afghan Crochet-a-Long: Block #18! 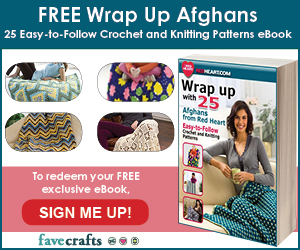 Your afghan is FABULOUS!!! I’m so sorry I missed doing it… can’t wait to hear what the 2015 challenge will be…. 😀 Thank you so much Tassie! 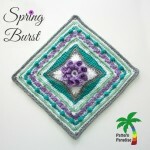 Thanks so much for organizing this CAL–and for your fabulous photo tutorials. 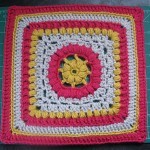 I haven’t worked through all the blocks but have learned a LOT about the design options with crochet. I am looking forward to your next project as I am sure I will learn yet more. What a terrific job you have done. Thank you. I’m so glad to hear you are doing a CAL for next year! I just had way too many things in my queue to pull it off this year! 😀 I’m glad to hear you’ll be on board! 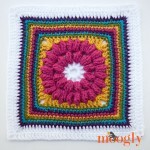 This crochet along was fantastic! Thank you so much for all the hard work you put into it. I’m still working on joining everything but looking forward to showing off the finished product! WOW, looks stunning. I still have the last 4 blocks to do as I’ve been busier at work the last month, so am really looking forward to catching up and finishing over the Christmas break. Thanks for detailing how you got the stitch count the same on each one, that’s the only bit I hadn’t quite got me head around, and I suspect part of the reason I haven’t MADE the time to catch up! Really looking forward to seeing all the other photos. (just spotted my typo- should say ‘got MY head around’!! 😀 Thank you so much Sarah! I think every project is a learning process – and the bigger the project, the more we learn! I didn’t join your fb until later this year. Each time I would see a block posted, I wished I was a part of it. I have loved your creativity. I was wondering where I could find all of the blocks. Are they all in one place? Thanks for keeping us busy through the year! This project had a personal, to the heart meaning to me, I’m so proud I finished. I learnead a lot in this year. <3 I’m so glad you joined in Liss! Thank you! That looks awesome! I cannot believe I have been working on a project for an entire year. Since I am making two of each I had 48 squares to complete, and I’m happy to say they are done! Now the joining. I was going to just do a simple mattress seam, but seeing your tight braid join I might change my mind! Cannot say thank you enough for organizing this, this was so much fun! 😀 Thank you so much Jackie! It was a lot of fun to lead, and I’m super excited about next year too! Beautiful! 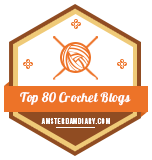 Thank you for sharing and for hosting the crochet-along! I wanted to do it this year, but procrastinated too long until it would have been too late for me to catch up. I’m definitely making an effort for 2015! I appreciate all your efforts and love your site – I visit practically everyday. Thanks for all you do! I came back to your blog to see if you have posted any details about CAL 2015 ! I am not sure if you remember, but I had posted my comments on ideas for what to do in CAL 2015, and I was curious and eager to find out if you had posted details…. Your CAL blanket is so awesome !!!! I am all the more motivated to keep myself tuned to your blog so that I do not miss the details of CAL 2015, and I really wonder what you are going to come up with based on the various ideas that you may have gathered!!! Keep up the good work and I really look forward to participating in the CAL 2015 and hopefully it should catch my interest!!! 😀 Thank you Niko! I’ll be sharing the details for 2015 on the 18th. 🙂 I hope you like the plans! 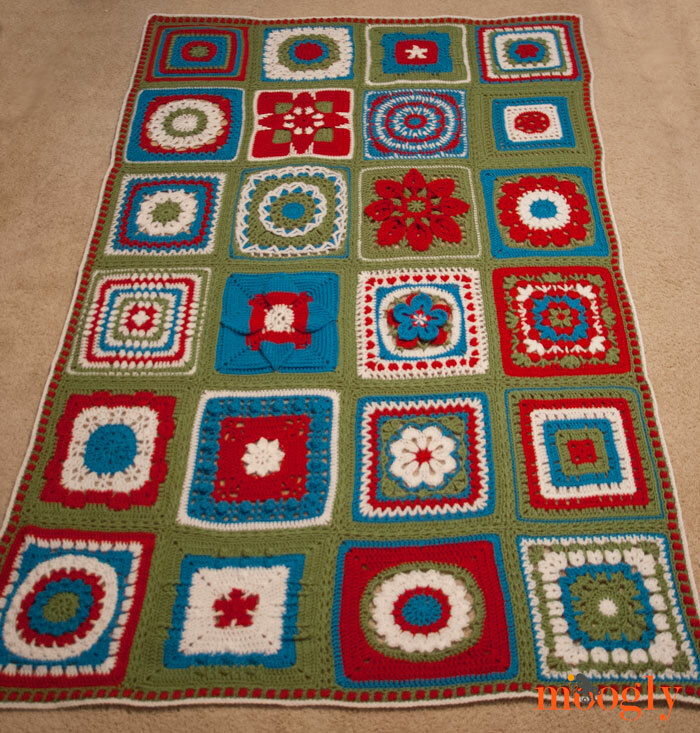 I finally posted about my finished afghan. 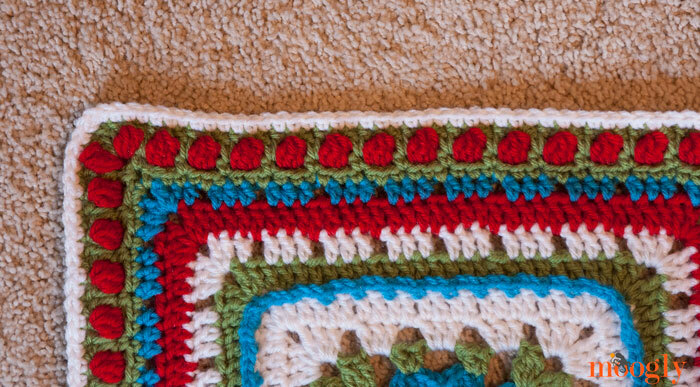 Even though it wasn’t 100% what I had in mind, I really love how my crochet-along blanket turned out in the end. This project was a lot of fun to do myself, and I enjoyed following along with other people’s progress, too, and seeing how really different the same pattern turns out with everyone’s small adjustments. It has to be a lot of work (background stuff we don’t see as participants) to run a crochet-along, especially for a whole year. Thank you for hosting! This was the closest thing to an actual crochet circle (something that doesn’t exist in my offline world) I’ve yet known, and what fun!! How many skeins of yarn do I need for the crochet_a_long? Thank you. 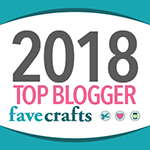 Unfortunately I’m just finding this as you are already starting the 2015 CAL, but I’ll be spending the morning hunting for and downloading as many of the 2014 blocks as possible to add to my CAL hoard. 😀 There are some good ones! I hope you can join us for 2015! Your afghan turned out AWESOME!!! I can’t wait to finish mine. What I plan to do is while I wait for the next square in the 2015 CAL, I’ll work on my remainder squares for the 2014 CAL. I believe I have four more to do. If any of those are paid I’ll of course pick a free one. I must say that I’m excited that I found your blog last year and that you are having these CALs. 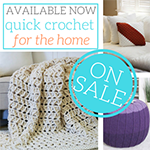 Crochet is relaxing and your CALs give me a goal to reach with my crochet!! Thanks!! 😀 Thank you so much Sherika! The latest block just debuted this morning, so you’ll be busy for awhile at least! 😉 I’m so glad you’re enjoying the CALs! 😀 Thank you Beth! Some of the patterns are no longer free, unfortunately, but they should all still be available. 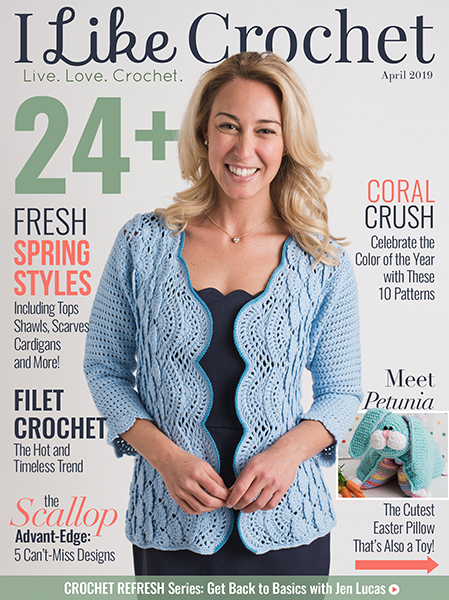 That’s something we improved on for 2015 – this year’s patterns will be free forever! 🙂 Getting better every year!